1. Over the past few decades there has been a gradual awakening to the fact that humanity’s planetary assets and common interests are being severely damaged. By whom ? By the acts and omissions of politicians, governments, corporations, many international bodies and by the policies they impose. These are responsible for all bad leaders and bad governance wherever it is found. These are actively creating and sustaining all the big global problems that we highlight in our Global Concerns pages. Our measure of whether a leader, government or corporation (or any other body) is ‘bad’ or not is : Have they done or are they doing anything (anywhere) that causes, sustains or worsens any of the big global concerns ? 2. Speaking of bad leaders, we at Red Line Art Works are not fixated on the repulsive Trump in the USA (or any other current bad leader) but Trump reflects and represents the ugliest things in american culture - and worse. Our profile of Trump is here. He is a poisonous and polarising politician by any standard. As the leader of the world’s most economically and militarily powerful country the powers vested in Trump by the US constitution are considerable. It gives him great freedom and power so the potential damage he can do in the USA and across the world is greater than many other bad leaders around the world, some of whom are more constrained by their laws and constitutions. Trump is pushing forward neoliberal fascism, pure and simple. Given the awful history of fascism and fascists leaders, it serves nobody to deny this. Trump should be called out at every opportunity for the racist and fascist misogynist that he is. We believe there is some better news about Trump which you can read in our account of Trump's 'End Times', which are already in progress. 3. We fully understand why so many people are very anxious about Trump (we are too) but he is an outcome/consequence of at least three bigger problems (more on this here). Even if Trump was to disappear tomorrow, these three big problems with the US constitution and political culture would still exist and need to be solved. Trump alone is not ‘the big problem’. The big problem is that of ‘State Capture’. The US has been ‘captured’ : Taken over by the extreme right-wing, the rich, big business and corporations, acting together as a corrupt elite, interested only in enriching themselves at the expense of ordinary citizens and the health of the planet. The USA is actually an Oligarchy, working within the pretence of a democracy, pursuing policies to suit the interests of the powerful few, not the many (for specific evidence of that see paragraph 7 here). Trump and his neoliberal fascism are an obvious and repugnant outcome or consequence of these bigger systemic problems in the USA. Unfortunately, state capture (in different forms) also exists in plenty of other countries around the world. Kleptocrats, and many more. We have listed about 100 examples of bad leaders here, some from the past and some from the present. It would be impossible to put the names of all the bad leaders on this list - it would be far too long. For each name on this list there are many others that can be added because each of these bad leaders has / had many hundreds (or thousands) of enablers, collaborators and active supporters, working closely with them or for them. These are all complicit in the bad leaders’ wrong-doings and may include, for example : Politicians, government ministers, political parties and their funders and members, press and media moguls, military leaders, heads of police, heads of security services or secret services, business people, corporate leaders, millionaires or billionaires, etc. So this list really only scratches the surface of this big global problem. 5. The stories of just the 100 leaders we list here have so far filled thousands of textbooks and millions of news pages. The authors of these books tell us all how these leaders came to power, document their wrongdoings and spell out the awful consequences which have affected (and still affect) billions of people. In today’s globalised and interconnected world there is no doubt that bad leaders have caused and are still causing enormous global, national and local problems. What Problems Do Bad Leaders Cause ? • Bad leaders often promote division in order to gain and hold on to power. Bad leaders will tell any kind of lies to get into power and to stay in power. Once in power, they then pursue policies designed to create economic, social, ethnic, or religious conflicts in their own countries or with other countries – their tactic is to ‘Divide and Rule’. • Bad leaders may also exploit or take control of weak state institutions (e.g. Constitutions or Laws), suspend them (for example in ‘States of Emergency’), damage or remove democratic mechanisms (for example suspending, cancelling or rigging Elections or preventing legal actions against themselves). They use associates to help them, such as the Military, the Police, Security or Secret services, the Press or Media, or corporations such as those in the arms industry or (to restrict access to the internet) in big technology corporations. have no intention of tackling the problem seriously or in the interests of ordinary citizens. In an influential 2014 report titled ‘Working for the Few’ Oxfam, summarised the main point: “Extreme economic inequality and political capture are too often interdependent. Left unchecked, political institutions become undermined and governments overwhelmingly serve the interests of economic elites to the detriment of ordinary people.” In other words, corruption can flourish when elites control the levers of power without any accountability.” Trump’s claim that he alone would “Drain the swamp” by reforming the Government in Washington clearly gained him many votes but all he has done is replace the alligators in the ‘swamp’ with his own who are loyal to him. The electors who voted for Trump have not elected a genuine anti-corruption leader, they voted for a Con Artist. Trump is rolling back key anti-corruption legislation, freeing-up corporations to do as they wish and ensuring they get big tax giveaways, ignoring conflicts of interests that exacerbate (not control) corruption. His policies are enriching the rich and making the poor poorer, exactly as he always intended. • Bad leaders may foster armed conflicts within their own country (e.g. in recent years in Burma/Myanmar, in the Phillipines, in Thailand and in many other parts of the world). There are many examples of leaders using military forces, police or secret services to attack and imprison citizens of their own country, often including journalists and artists. Recent and current examples include China, Syria, Zimbabwe, Turkey, Rwanda, USA, Russia, Spain, Yugoslavia. If we look at the list covering the past century it is very long indeed. This has often been part of wider activities of political cleansing, ethnic cleansing or religious cleansing. •	In Syria the world has watched (and done little or nothing) while the Russian-backed regime of Bashar al-Assad has carried out brutal massacres in Aleppo, Homs, Ghouta, inside the capital Damascus and in many other places. Among the hundreds of thousands of his own citizens killed by his regime have been many thousands of innocent children - while President Putin of Russia has given Assad both political and military support. From an estimated pre-war population of 22 million (in 2011), the United Nations in 2016 identified 13.5 million Syrians requiring humanitarian assistance, of which more than 6 million are internally displaced within Syria, and another 5 million are refugees outside of Syria. We hope that the many participants in this conflict (including Russia and the USA) will one day be held responsible for their war crimes, crimes against humanity and the many other crimes they have committed. •	China, Iran and Turkey are among many countries with bad records of jailing journalists and activists. The former democracy in Turkey, once courted by the European Union as a likely new member has seen a failed coup attempt in 2016 used by President Erdogan and his brutal regime to solidify his power and to push his political agenda. Erdogan’s regime has been closing down democracy and its institutions in Turkey. Any political opposition has been targeted. Hundreds of thousands of public servants have lost their jobs and their incomes overnight. Thousands of journalists, artists, activists and others have been jailed. • Bad leaders may support ‘rebels’ or ‘insurgents’ or they may carry out or sponsor destabilising activities in their own or other countries (e.g. Israel's actions over the past century in Palestine). The USA has actively armed and supported numerous covert or secret activities and secret forces inside other countries over the past one hundred years, at least. At any one time in dozens of different countries around the world the USA is using its Central Intelligence Agency (CIA) and its other ‘secret services’ to destabilise governments, oppositions, liberation movements, community groups, people’s movements, trades unions, economies, etc. For several years now the USA’s Presidents have authorised the illegal killings of hundreds of people using Drones and ‘automatic aircraft’. About one third of the people killed have been innocent children. These murders are said to be ‘signed off‘ by the US President in routine weekly meetings. The USA is not the only country with Drones spreading death across the world, secretively and unaccountably - Britain, France and Israel are also guilty of killing civilians with their Drones, as well as supplying Drones to other countries. • Bad leaders in several parts of the world have exploited and fomented multi-lateral or bi-lateral conflicts– the examples of India-Pakistan, China-Japan, North Korea-South Korea, Israel-Palestine and many others come to mind. • As we saw above, bad leaders deliberately magnify divisions among their own population so that they and their political allies may gain, retain or increase their power within the state. This ‘Divide and Rule’ tactic has also happened consistently in countries that claim to be beacons of ‘Freedom’ such as the USA and Britain. It is a favoured approach of rich and powerful elites running the countries for their own benefit, with the majority of their citizens powerless to bring about anything more than occasional, short term or cosmetic changes. Across the world this means it is 'Freedom' for the rich minority while billions of poor people's lives and futures are continually degraded. support for the poorest citizens - such as health, welfare and education. By doing that they restrict the lives of individuals, families, communities and whole nations, including their future lives. Following the global financial crisis of 2007-8 the governments in many neoliberal capitalist countries gave big 'Bailouts' to rescue Banks and other financial institutions. Governments then used the propaganda of ‘Austerity’ (a false ideology) to persuade citizens that they caused the crisis and must therefore pay for the financial crimes which were actually committed by the governments, financial institutions and corporations. Since then, the inequality has increased greatly in these countries and it is now common for the night-shift cleaners of corporate offices to pay more Tax than the CEO of the corporation. • One last example of the problems caused by bad leaders : All of the world’s current leaders are jointly guilty of keeping in place policies responsible for the deaths of around 19,000 children EVERY DAY from preventable causes (according to figures published regularly by UNESCO over the past few years). This is unforgivable and should shame us all, especially our leaders who we empower to end problems like this. 7. The above list of examples of problems caused by bad leaders has hardly scratched the surface of their wrongdoings. In truth, bad leaders and bad governance should be prevented at source – by their own country’s constitutions, laws and justice systems. Instead, bad leaders are created or tolerated within states by, eg : corrupt elites, weak constitutions, weak laws or failing justice systems, faulty electoral systems, biased armed services and police, corrupt or biased press or media, illegitimate power-bases, etc. Genocide, Crimes Against Humanity or the newly specified crimes of Aggression (the latter from 18 July 2018). 9. 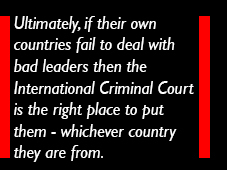 The International Criminal Court is really still in its infancy (more here) and has not really begun to improve the general standard of leadership or governance for the world’s citizens. However, states can volunteer (or not) to join the ICC and some big states have NOT joined including three of the five 'Veto'-holding members of the UN Security Council. Those who have not signed up to the ICC include many of the most powerful nations : USA, China, Russia, India, Pakistan, Saudi Arabia, Iraq, Syria, Turkey, Israel, Yemen, Ukraine, Indonesia, Malaysia, North Korea, Myanmar (Burma), Egypt, Rwanda, Libya, Algeria, Zimbabwe, Greenland, Cuba, and many others. Apart from anything else, it is disgraceful that three big 'Veto'-holding states are allowed to dominate the UN Security Council whilst keeping themselves immune from key international laws. 10. Gradually, over the last few decades thousands of non-governmental organisations (NGOs), ‘Watchdogs’ and campaigning bodies have been doing great work investigating and exposing what politicians, governments, corporations and international bodies are doing (or failing to do). These NGOs and thousands of Whistleblowers have been exposing what is really happening across the world and within States. A long list of Whistleblowers and what they have revealed can be found here. The growth of the internet in the past couple of decades is helping NGOs to ensure that ordinary people all over the world can now find out more about what is really happening. 11. These NGO’s critiques of the ‘status quo’ at global, national and local levels is now very comprehensive, detailed, and increasingly influential. These NGOs cover a very wide spectrum of global concerns, including all those which are highlighted here in our summaries of the big Global Concerns. You can see some of the key NGOs in our list of Links here. 12. As a result of all this work by NGOs, Watchdogs and Whistleblowers, a massive set of uncomfortable truths have been emerging about what politicians, governments and corporations have been doing (contrary to all our interests). As a result, each year hundreds of millions more people are awakening to these damaging policies and activities. The so-called ‘World Order’, the status quo, is obviously insecure and highly dysfunctional. It is in itself a major global concern. There has been a growing sense that we have all been misled into not just one big global emergency but several. 13.	International bodies have also not been preventing this when they should have. Instead, they are too influenced by bad leaders, governments, and corporations which have been allowing and enabling extensive harm and creating great risks to people and planet. For example, they are allowing governments and industries to emit greenhouse gases which are causing global warming. They are keeping in place policies which enable economies and financial institutions to create vast inequalities and inequities across the world. They are allowing enormous poverty, famines and wars to develop and persist. 14. What we would like the big International bodies to do (but they show no sign of doing this) is to insist on every State having a good robust constitution including integral high standards of leadership and governance that accords with global best practice in the interests of the vast majority of the world's citizens. What Can Art and Culture Do ? 15. Leaders and Governments have not given the International Criminal Court the powers to tackle this epic scale of wrongdoing. So, its essential that NGOs, Whistleblowers and we (the public) should speak up about this in whatever ways we can, whenever we can. If we are lucky enough to live in countries with relative freedoms and are lucky enough to have received an education then we have been privileged - and with that comes responsibility. That is why we at Red Line Art Works ask artists and creative people across the world to ‘speak up’ in their art works. These are potentially more powerful than thousands of words. 16. Changes in the culture, among the mass of the people, can expose politicians and political systems to pressures which lead to progressive change. Indeed, there is plenty of historical evidence from all around the world that big pressure from the mass of the people is sometimes the only thing that can bring significant changes to leadership and governance. 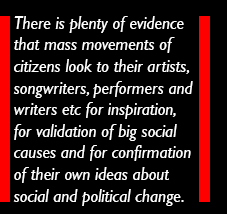 There is plenty of evidence that mass movements of citizens look to their artists, songwriters, performers and writers etc for inspiration, for validation of big social causes and for confirmation of their own ideas about social and political change. This pressure on politicians and institutions might have to be sustained for years (even generations) before the desired change eventually comes. Think of the fall of Apartheid in South Africa, the fall of the Soviet Union and of Communism in eastern Europe - and many more big changes achieved only after years of struggle. Artists cannot expect to leave all of the struggle to others and just selfishly take the benefits when the change comes. That is no way to ensure respect for your art or for yourself. We all have to be in the struggle, in whatever way we can. Keeping silent is being complicit with the wrongdoing which can be seen around our world. 16. As we end this Introduction to bad leaders and governance we ask you to consider this question : Do bad leaders cause bad governance or vice-versa ? This is a bit like the question : Which comes first, the chicken or the egg ? Of course, it works both ways. Bad leaders and the constitutions and laws that allow them to get into power are ultimately responsible for all of the big global concerns, risks and threats which now face humanity. So, bad leaders and bad governance are always related and are often two sides of the same coin. Global institutions and States all need constitutions and laws that will prevent power ever being given to (or taken by) bad leaders. However, the whole world is unfortunately still a long way from that situation, which is why the big global concerns are so enduring.